Goode And Wright is a lovely little hidden gem on the vibrant Portobello road. With a name like Goode and Wright, they've set themselves a bit of a high standard to live up to! After strolling through Portobello market we arrived at Goode and Wright for lunch where the casual monochrome floored cafe slash restaurant overlooks market stalls and passers by. scrambled duck eggs with toasted sourdough bread. Cheesy chips with truffle and caper mayonnaise. Roast poussin and an avocado salad. The crappy photo that I took really doesn't do this plate of food justice. Sorry! Goode and Wright serve up the best cheesy chips I've ever had! Hot fries arrived at our table with a generous covering of flavoursome, melted cheddar cheese and a good sprinkling of fresh herbs. So much better than that fake cheese out of a bottle! The cheesy chips are spot on with a soft fluffy center and light crispy outer. The scrambled duck eggs at Goode and Wright are sensational! This was my first time enjoying duck eggs and I really liked em. There's something a little different about duck eggs in comparison to chicken eggs. The scrambled duck eggs at Goode and Wright are lovely and creamy. 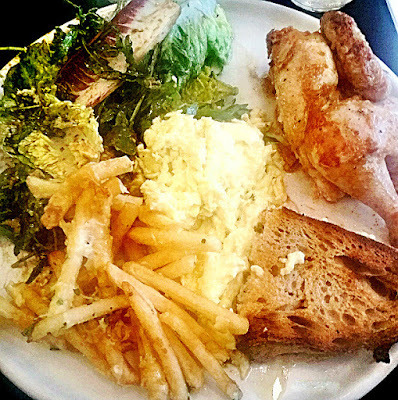 The toasted sourdough bread was really yummy, and the tender poussin was well..tender! The avocado salad was also really delicious. We ummed our way through lunch, leaving Goode and Wright on a high. Everything was perfectly cooked and perfectly seasoned. I definitely want to go back to Goode and Wright again to re-live my food experience. If I do I'll take a much better photo. Promise! I hope our order will be just as Goode...and Wright! Found this Goode and Wright Restaurant review useful? The photos of food and location in this blog post which were taken at Goode and Wright. Along with any text and personal opinions about Goode and Wright restaurant and menu are copywritten by said owner of www.gonesunwhere.com The photographs and text on this blog must not be copied. Distributed. Sold or printed without prior written consent of this travel and lifestyle blog owner. Contact this site owner for more details.